Students hear it all the time — internships provide essential opportunities to build real-world experience before graduation. 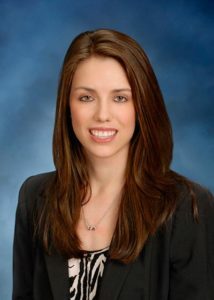 But for alumna Kelsey Myers (B.B.A. ’14), relationship manager at USAA, her internship did that and more. It led her to a full-time career. Myers, who first joined USAA as an intern with the Military Affinity management team during her senior year at St. Mary’s, is now responsible for managing the end-to-end relationship with affiliate organizations that serve and support the military community. “Managing these relationships includes communication with leadership, budget management and development of strategic co-branded marketing plans,” Myers said. USAA has relationships with 57 organizations that include the Wounded Warrior Project, Disabled Veterans of America, and The American Legion. Opportunities like internships and in-class business case scenarios at St. Mary’s helped prepare Myers for her job at USAA. Myers credits her senior capstone class with Richard H. Priesmeyer, Ph.D., Professor of Management, for preparing her to manage relationships. “We worked on business case scenarios to think strategically and holistically on how it fits in the world,” she said. Myers applies the skills she developed at St. Mary’s and has continued to expand her relationship and leadership skills at USAA. She stresses the importance of internships. Myers shared some words of encouragement for students seeking internship and career opportunities.